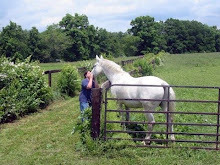 This past Thursday I received an e-mail from my friend Victoria over at Teachings of the Horse. It seems she belongs to a trail riding association and had received an e-mail about Arabian horses in need of immediate rescue. The horses in need of help were a 25-year-old mare and two stallions (her colts). Their ages were 4-5 and 5-6 respectively. The woman who owns them is suffering from incurable cancer and was taken to a hospice earlier in the week; she is no longer able to care for them and the decision was made to put them down if a home could not be found by the end of the week. I contacted my daughter and asked her if she would be willing to rescue the horses and take them to our farm. I needed her to agree because she is the trainer/manager and would have to find the time to rehabilitate the mare and work with the younger stallions. No one is sure whether they have ever had any training whatsoever. Even older, trained stallions can be a handful, so young untrained ones would be a major undertaking, to say the least. Naturally, she said yes; when have we ever not taken in a horse in need? After arrangements were made, and the trailer was hooked up and ready to roll, we left six o’clock Saturday morning for the three-hour drive to pick them up. Upon arriving at their barn, which had seen better days, we were told by the girl supervising the rescues that, if we could take one stallion, she had a reputable breeding farm close by that would take the other stallion. This was a relief, as we really had only one stall available and the other stallion would have had to live outside in a run-in shed. The decision was made to take the mare and one stallion and let the other go to the breeding farm. I am happy to say we got first pick, but it was a hard decision. They were both incredibly sweet, very handsome and, after seeing them both walk/trot around in a quick turnout situation and getting some sketchy background information, we thought the younger one would fit in better with our herd dynamics in the future. The older stallion was not accustomed to being in a herd situation and was more comfortable being alone; he did not get along with other horses and so, although he was very sweet and more settled, we thought the younger boy a better choice for us. He had been turned out with a companion gelding and was very distressed about losing his best friend (who had been adopted that morning) and we thought his sociable, friendly nature made him more likely to be happy among our herd. There will be more on the stallion in the next post, but for now, I want to tell you about the mare. The 25-year-old mare was being housed in the indoor arena with a mini horse as her companion, who was also adopted out that morning. 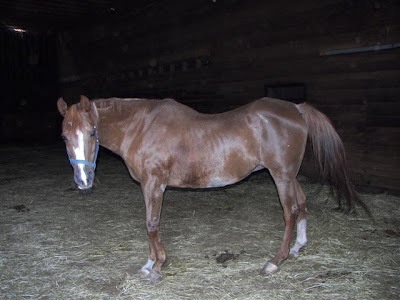 Considering the condition of the barn and her neglected condition, it is my feeling that she had not seen the light of day in at least a year. Her feet were severely overgrown, looking like they had been neglected for at least a year, and her body was covered in sores and rain rot scabs. She looked miserable. The only thing I am grateful for is that none of these horses were starved for food - only affection. She was so sweet and so happy to have some attention; she was actually hugging us and nuzzling us when we went over to meet her. I have never in all my years with horses come in contact with a horse as sweet and loving as this mare. We both fell in love with her at first sight. As we started walking out of the arena to see the stallions, she called and called to us, though she couldn’t follow us to the door due to the state of her feet. It was heartbreaking. I truly think she was asking for help. When the time came to load them, she was the first one on the trailer, and if her feet would have allowed, I think she would have run up the ramp to escape this place.. But, ever a classy lady, she just walked onto the trailer with no fuss and proceeded to munch the hay from the net. Our vet will be paying a visit on Thursday so there will be more information on her condition and that of her son after then. "If all the beasts were gone, man would die from loneliness for whatever happens to the beast, happens to the man"